Yes, I realize it's been over a week since the September kit gallery was revealed... BUT ... it's like a tradition here at Label Tulip to highlight a few gallery favorites so here I go! Also, the two add-on kits are not sold out yet so you may want to check them out! 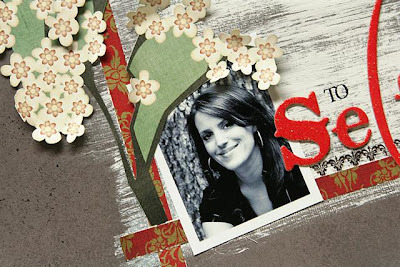 First, our guest designer for September, Tina- 1995 Wiser. Holly's thankful card just puts me in a Fall mood! 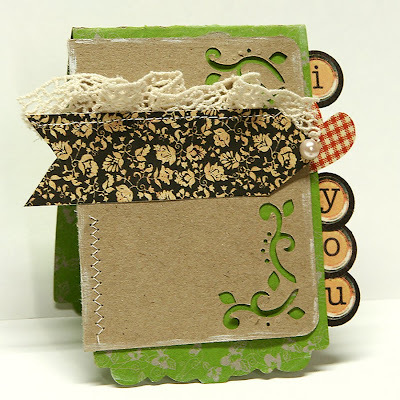 Love the pretty layering! 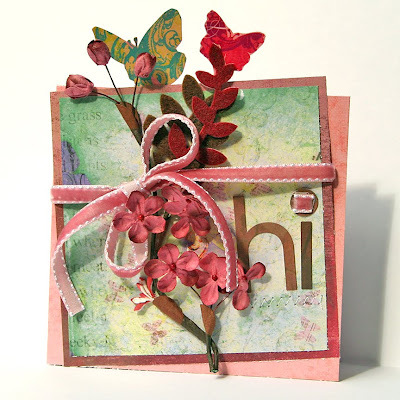 Anabelle's hey girl- gorgeous design and just look at the intricate cutting work she did! Christina- 18. - Amazing work. 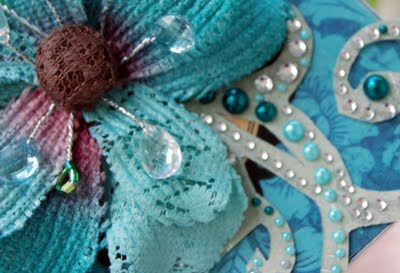 I love how she took apart the large Prima flower and used it on this page! Ingenious! Dani- Kiss Me. I'm such a sap about men and their children. 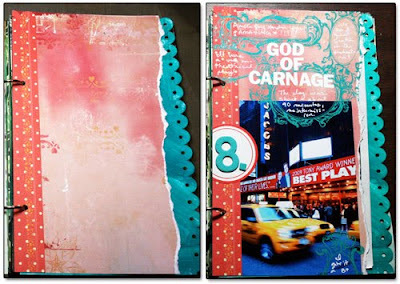 This page is sweetness and beautiful design rolled into one! Julie- Day Dusk Dark. Love the photo progression here and fun design! Kimberly- Poppy's rule. 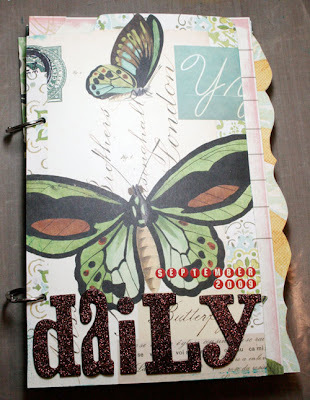 What a gorgeous page with the pink and all those amazing butterflies! Leslie- dear Leslie. Love the techniques and layering on here! So much eye candy! Be sure to check out the Challenge area for this months challenge, member lift, close ups of the projects and lots of fun tips! 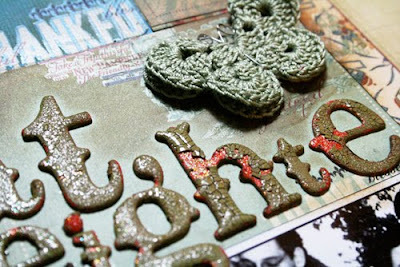 Also, be on the look out for some little hints at October's kit! Hey everyone! A sweet lady showed me this simple way to fold a punched circle at CHA... she showed me how I could make a flower from the folded circles. I have since had this idea pop into my head. I went out the other day and got everything I needed for this project. 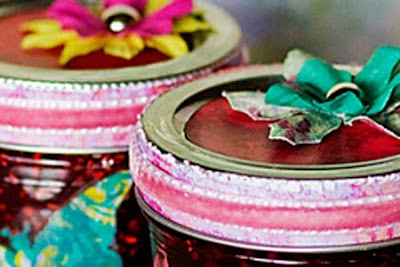 The beauty of this project is that it's not really that difficult and it can be changed based on the holiday or season. You could make a valentine wreath, easter wreath, halloween wreath, fall, etc. 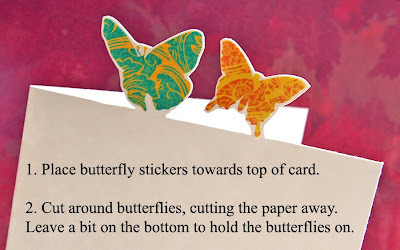 by simply changing the color/pattern of the paper you choose and changing the embellishments you use... maybe some easter eggs for easter or some stars for the fourth of july! 2. Styrofoam wreath (I used a small one - aprox 8.5 inches across). 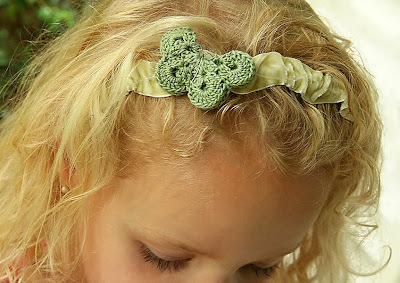 I also chose a white wreath but you could probably save time by getting one of the green colored ones. 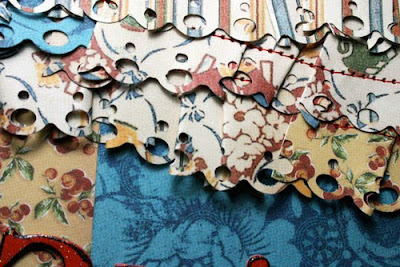 I used Piggy Tales patterned papers, Creative Imaginations brads and flowers. Making Memories leaf straight pins, WRMK glittered brads. I painted my white syrofoam green with pebbles inc acrylic paint and allowed it to dry completely. 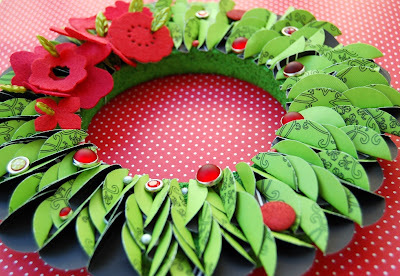 If you want to hang your wreath with a ribbon then start by tying and securing your ribbon around your wreath. 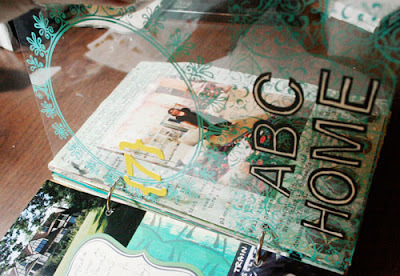 Cut your mounting tape into thin strips (I found that the scotch mounting strips I was using were too thick). 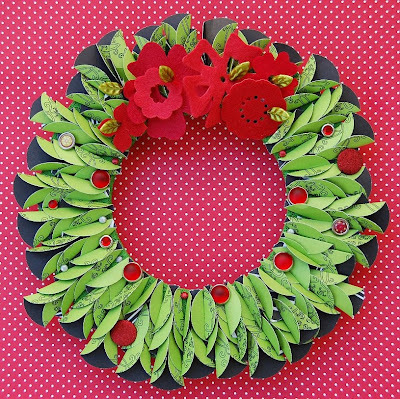 Place the folded circles inside one another and mount onto foam wreath. 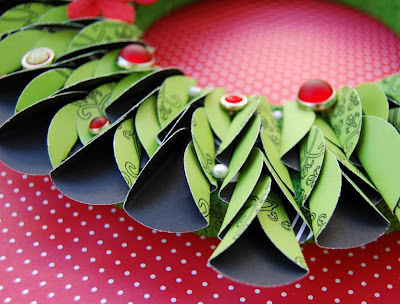 Cover the entire wreath with folded circles as seen. Next, embellish away. I found that I needed to add a bit of adhesive to the base of some of my brads to make sure they stayed in place. Then I used straight pins to pin my "poinsettia" flowers in place up at the top. Hang and enjoy! As far as storage goes- My wreath is small enough that I carefully placed it in a gallon ziploc storage bag. Just make sure the wreath isn't placed under something that could squish the leaves. Be sure to show me your creation if you choose to make one of these! Share Label Tulip With a Friend and WIN! Hello Everyone and I hope you have had a GREAT weekend! After taking in a little summer sun, things are all a-buzz here at Label Tulip! 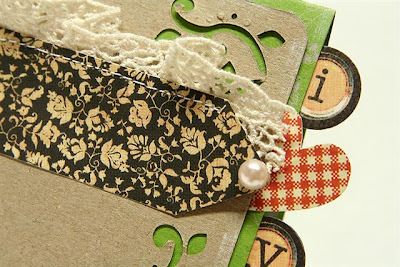 The September kits sold out so fast and there are only a few cardstock and add-ons left -- hurry while they last! 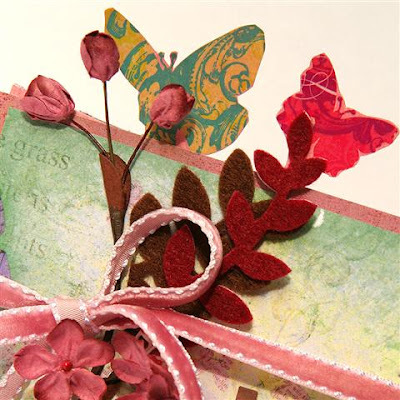 With an AMAZING October kit right around the corner (I spent the weekend planning the kit, it's amazing, 4 different varieties of paper, amazing embellies, you're going to LOVE IT! ), the deadline for the Design Team Call ending tomorrow 9/21 at 11:59pm PST, and so many new ideas running around in my brain I want to introduce to the club, I thought maybe it's time to have a CONTEST and get some of these ideas goin'!!! Yes, that's right, it's contest time. For the next 2 weeks, we are featuring the "Share Label Tulip With a Friend" contest. This contest has 2 ways to win, so please make sure you read carefully so you don't miss out on your chance to pick up one of these FABulous prizes! --For every friend that you can encourage to sign up for and "play" around in our forums, both you and your friend will be eligible to win a Label Tulip RAWK (photo to be released later this week on the blog, but I promise you, it's a good one!). Here are the rules: when your friend signs up for the forums, please have them send me a PM with their name and your name. During the next 2 weeks, they must post at least 10 times in the forum; on October 5th, we will announce the winners and each one will receive the RAWK kit. So, for example, if you encourage your friend Jenny to sign up, Jenny will PM me with her name and yours after registering in the forums. You are eligible to win for each friend that enters. Our online community continues to grow leaps and bounds and this is just one more way we can share our wonderful Label Tulip Message Forums with as many friends as possible. 2. Have a Friend Subscribe and Receive a Free Subscription! 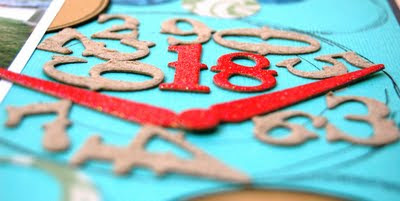 What am amazing deal to get 3 EXTRA MONTHS of Label Tulip kits -- a value of $118!!! Both of these contests end 10/5/2009 so get your friends' entries in as soon as possible. Good luck to everyone and I can't wait to see who wins! Please feel free to leave your comments here, as I'm ALWAYS happy to hear from you all, I read every single comment you leave! I'm sooooo excited for October, you're doing to die when you see the kit!! 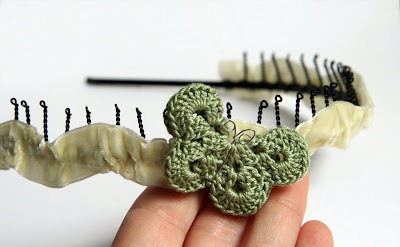 This is such an easy way to use up the bits and pieces left over from your kit. Nothing goes to waste and you've got a head start on your next project. Plus, you know it all works together, so there's no need to even think about it! On the left, the bare bones page. On the right, the finished product. 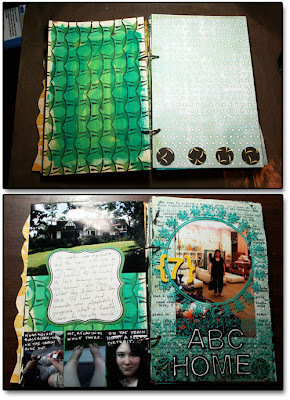 I used a grouping of Hambly rub-ons to add journaling spots to the top of my page. 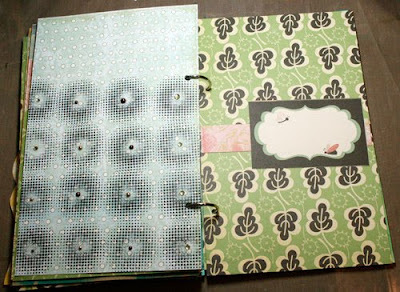 The top is the bare bones page and on the bottom, the finished product. 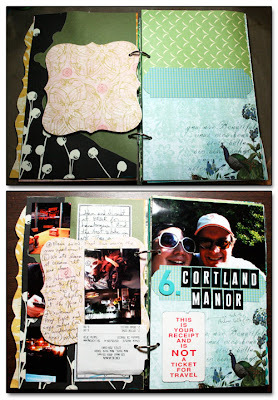 Notice how I tucked my photo underneath the long Chatterbox tag running across the center of the right hand page. I love the seamless look that creates! This is such a fast and fun way to do your memory keeping. 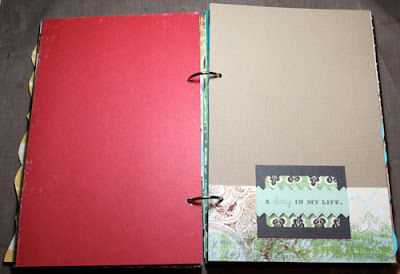 The next time you have kit leftovers, I hope you'll consider making a daily album!